Wrongful Termination Lawyer – Do I have a case? – Was My Firing Illegal? – Can I Sue My Former Employer for Wrongful Termination? – Do you have the legal grounds to file a lawsuit against your former employer? – Do I Have a Wrongful Termination Case? – How do you prove wrongful termination? – I believe my firing was illegal. Can you listen to my story and let me know if I have a case? – What Is the Statute of Limitations to File a Wrongful Demotion Lawsuit? Being fired from your job is an event that can turn your entire life upside-down. Losing your job can an extremely stressful time because you all of a sudden have lost your steady stream of income which you use to pay for food, rent/mortgage, loans, and the livelihood of your family. If you believe that your firing was wrongful termination, you may have a right to file a lawsuit against your former employer. Do you have the legal grounds to file a lawsuit against your former employer? Here are a few things that may help you determine if you have a wrongful termination case. Even though California is an at-will state and gives your employer to fire you with or without reason, it does not mean that they can fire you for any reason. The employer cannot breach any contract (written or oral); they cannot violate public policy (federal, state, nor local); and the employer cannot retaliate against any employee who brought unsafe or illegal work practices to light. To prove a wrongful termination, you would consider various scenarios. If you signed an employee contract which states certain promises, job security, growth, and other aspects, you have a strong argument against you being an at-will employee. For example, in your contract it may explicitly state that your employer can only dismiss you if they have a good cause or for reasons which are inscribed in the contract. If long-term promises were made upon your hire. Not detailing the negative aspects of a job, like having to travel to dangerous neighborhoods late at night. It is against the law for an employer to fire employees for reasons that are in violation of the state and federal laws put in place to protect certain groups of people. Here are a few things to know if you believe your termination was unlawful. Termination discrimination for sexual orientation. If you believe that the reason for your termination fits under these laws, you may have a right to file a wrongful termination lawsuit against your former employer. Our Los Angeles wrongful termination attorneys can sue your employer and get you the justice that you deserve. Based in Los Angeles, our lawyers take cases from the entire state of California. Show that you engaged in a legally protected action, like, for example, filing a complaint with the Equal Employment Opportunity Commission against your employer. Your job is legally protected if you file a complaint. That your employer acted negatively towards you and had adverse effects on you and your position. 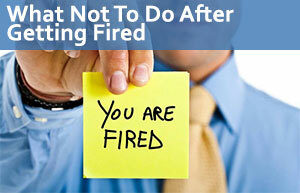 For example, you were denied promotion, fired, or given an unjust negative review about your performance at work. Your employer cannot retaliate against you if your activity forced them to act. They cannot terminate you if they find out you are going to file a lawsuit against them for racial discrimination. Employees are protected from whistle-blowing against their employer because of the whistle-blowing laws that protect the employee. The whistleblower laws protect employees who bring to light any illegal activity, which breaks laws, regulations, or ordinances, in which their employer is taking part. If you believe that your former employer wrongfully terminated you from the job you held on either discrimination, retaliation, and harassment, you have 12 months to file the lawsuit in court. If the EEOC believes your claim to be legitimate, you will be given a “right-to-sue” letter which gives you the right to sue your employer. The time allotted to file a lawsuit or claim against your former employer gives you 90-300 days to file your lawsuit, from the date you receive your right-to-sue letter. An attorney can make this entire process much, much shorter by acquiring the right-to-sue letter right away and promptly begin the lawsuit. If your employer terminated you in breach of public policy, meaning they terminated you for practicing your rights, you have two years to file a lawsuit against them from the date your employer dismissed you from your employee duties. Should your employer have terminated you for breach of contract, you have two years from the breach of the written or oral contract that was made when you signed on. The best way to determine whether or not you have a strong wrongful termination case is to contact an employment lawyer and have them review your case. Here at the California Labor Law Employment Attorneys Group, you have free consultation and a zero fee guarantee. The free consultation means that we will sit down with you and listen to you as you present your case to us. We will evaluate your case and give you our thoughts on whether you have a strong enough case. The zero fee guarantee means that you will not pay anything unless we win the case. This removes any financial risk from you and transfers it all on us. Based on our experience and past case results, we believe we are the best wrongful termination lawyers in Los Angeles. The California Employment Attorneys Group offers a zero fee guarantee. We never require our clients to pay any upfront fees. We will work on your case on a contingency fee structure, and when your case settles, our fee will be calculated based on whatever we recovered for you. Our attorneys also offer free consultations and free case reviews. Call or email us today to find out more about your rights.